A teething baby is one of the most challenging times for both mama and baby! 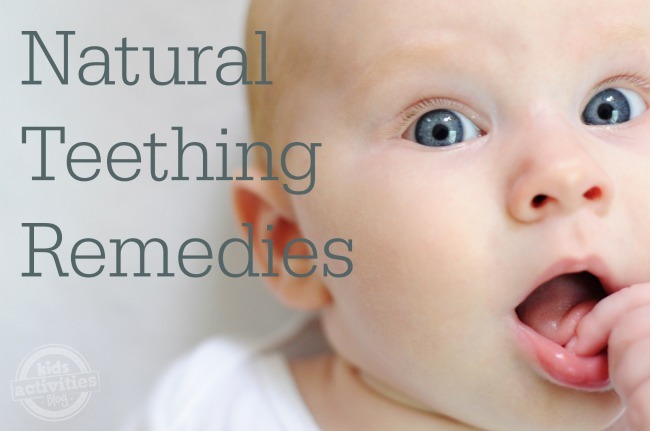 We have shared our top 10 baby teething products, but today we wanted to share some more unconventional teething hacks to help your teething baby using natural things from around your house or in your freezer! Please keep in mind that a lot of teething solutions involve letting the baby chew on something in her mouth. Use caution and common sense and don’t give your baby anything she can choke on or let her chew unsupervised by an adult. This is purely informational not medical advice. These ideas can be done using things you probably already have around the house! Frozen Bagels – Keep some bagels in the freezer for urgent teething emergencies! The texture of the bagel is really unique and the cold always helps too! Frozen Waffles – Similar in texture to the bagel but might add some extra sweetness! Washcloth and Chamomile – Wet a small washcloth with chamomile tea and freeze it until it hardens. The chamomile helps to soothe the gums while the texture of the cloth and the cold work together to numb and make baby’s gums feel better. Crushed ice and washclothes – Crush up some ice and put it in a washcloth. Knot the end so the ice doesn’t slip out. Baby is able to grip the knot end (which won’t be too cold) and chew the colder ice end! Fruit in a mesh feeder – Place frozen strawberries or other fruits in a mesh feeder and let baby chew on it. This works well because it tastes great and baby doesn’t have to hold onto something cold. Carrot fresh from the fridge (not frozen) – Be sure to use full size carrots so baby can’t swallow them and choke! But large, cold carrots were one of my son’s absolute favorite things when he was teething. Cold spoon – Stick a spoon in the fridge or freezer for awhile and then let baby gum it. Serve cold applesauce – Feels good sliding over the gums and it’s a yummy treat! Do you have any more teething remedies using things from around the house? Share them on our Facebook page!